Typical at-grade railway crossing with flashing lights, bell, and gates. 30 is proud to announce its Road Safety Team has been retained to complete rail crossing safety reviews for the municipalities of Mississauga, Region of Durham, Belleville, Woodstock, Cambridge and Waterloo. 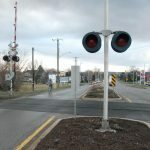 In June 2015, the Canadian government enacted new regulations regarding level rail crossings under the Railway Safety Act in response to a steady increase in rail incidents since 2011. Previous to the new regulations, the applicable guide standards provided guidance but were not mandatory. As a result, compliance rates were only 30-50% at public crossings. The Road Safety Team at 30 is helping municipalities across Ontario to become compliant, with an eye to budget. The Team has developed a methodology allowing for a high quality program with little involvement from the municipality–saving them time and money. To learn more, reach out to Russell Brownlee, Principal of our Road Safety Group and Rail Safety Group.